Insulin pen needles are intended for single use only but it is known that a significant proportion of people with diabetes do re-use needles. 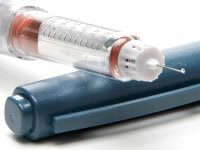 People with diabetes ultimately have the choice of whether they wish to re-use needles for injections. This article reviews evidence from research studies to help you make an informed decision about re-use of pen needles. Whilst this guide refers to insulin pen needles, the same principles will also apply to pen needles for injections of incretin mimetics such as Byetta and Victoza. What are the risks involved in reusing needles? The risks of the above will grow with each re-use. A study carried out at the Moscow Regional Research Clinical Institute found that bacteria were present after injections had been completed and that bacterial growth on needles increased with further re-use. Bacteria found on the needles was mainly bacteria found naturally on skin (staphylococcus epidermidis). Whilst this form of bacteria is usually harmless, re-use of needles could increase the risk of contamination of more harmful bacteria. The fine tip of needles can become slightly distorted with re-use and this can increase the chance of experience pain whilst putting the needle in or taking the needle out. If you are experiencing pain when withdrawing the needle, this could well be caused by distortion to the tip of the needle. The Moscow study referenced above showed that re-use of needles is associated with more pain. The study divided patients into groups that re-used needles and those that didn’t. Those that re-used needles in the study communicated higher levels of pain with their last injection. GlucoRx FinePoint Insulin Pen Needles are universal fit, screw on, sterile, single pen needles used in conjunction with an insulin pen for the injection of insulin. The shortness helps guarantee that insulin injections are subcutaneous (under the skin) and not intra-muscular. Comfort Point insulin pen needles are compatible with most commonly used pens and which are siliconised with beveling. MyLife Penfine Needles don't need to be screwed in and click to let you know they're in place. NovoFine needles from Novo Nordisk are among the shortest and thinnest available. Owen Mumford's Unifine Pentips are ultra-thin pen needles. Avoid any possibility of an accidental finger prick with the Novofine Needle Remover from Novo Nordisk. Studies show that the frequency at which needles are changed affects the risks of lipohypertrophy, with greater needle re-use linked to higher incidences of lipohypertrophy. Studies show that excessive re-use of needles (use of a needle more than 7 times) caused very small pieces from the end of the needle to break off, suggesting that microscopic pieces of the needle may be left in the patient. Needle manufacturers note that the safety checks that needles need to pass are based on single use only.